I have five children. Georgina (”G”) is the youngest. She is 14. And she is the one causing grey hairs to sprout abundantly from my scalp, if old wives’ tale about correlation between lack of follicular colour and stress is to be believed. 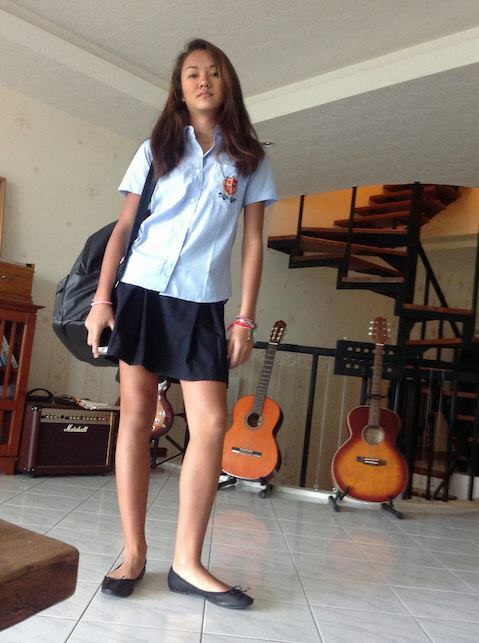 Today was her first day at a new school after the long summer break. I got up early to have breakfast with her and to kiss her goodbye at the door as per the perfect family scenario. But instead, we stood across the room from one another, the chasm as wide as our generation gap, snarling like a pair wild beasts. I was quoting the school rulebook aggressively at her, whilst she obstinately stood her ground. For starters, her skirt was far too short. School rule says, the hem must be skimming the knees. Hers was sitting defiantly somewhere mid-thigh, showing off her long coltish legs. Yes, she had done what bold schoolgirls from previous generations had – she had rolled up a good 10 inches of the length at the waistband. And then there was the make-up. Lashings of mascara and eyeliner. And lipgloss (“Mum, it’s for moisturising my lips, you don’t want me to have chapped lips, do you” With saccharine sweetness). And the multiple ear piercings (“OK, I will take my ear studs off when I am playing sports.” Grudgingly.). I stared at him in disbelief. “You can’t subcontract disciplining your child to teachers. It is our responsibility as her parents to raise her right.” That’s the Asian Tiger Mum in me speaking. The part of me that expects unquestioning, blind obedience, on the basis that I am the parent, therefore I must always be obeyed. But fortuitously, recent stimulating conversations with my neighbour Richard Boyle short-circuited the part of my brain that is conditioned and sleep-walking, to jolt the slumberous thinking part that my parents had invested a lot of money (three years at Oxford) to cultivate. Richard and I had been discussing the masses’ readiness to obey governments unquestioningly, blindly (is it laziness, fear, or lack of self-empowerment?) We concurred that one does not have to be a rebel or an anarchist to question instead of obeying blindly. It is about exercising one’s brain, it is about doing audits, it is about functioning as check-and-balance, it is about being alive, instead of going along like sheep and lemmings with the decisions of the minority who rule. For example, did you question, protest or think about fluoride in drinking water? Or did you accept the PR line that “It’s good for teeth”? What do you think? And so, having taken some time to mull over it, I think that raising a child right entails teaching him or her when and how to question authority – politely and constructively, of course – because it is part of the learning to become a thinking adult and a responsible member of society. This child of mine is fortunate that she has had far-sighted teachers in the past who had supported her mental growth. Most notably, Mr. Jonathan Booton. Yes, I blame him. With great affection. Happy parents = happy kids. So here’s a simple-to-make sweet for grown-ups, beloved of the Italians: tiramisu. It requires no cooking or baking whatsoever, just assemble and chill. First, you need to track down Italian sponge fingers (also known as lady fingers). The Italian name for these fingers are savoiardi. They are quite easy to find: in Jakarta, at Ranch Market or Hero Kemang, in Phuket, at the bakery by the supermarket in Central. If you can’t find them, I have included the recipe at the bottom of this post. But let’s start with the tiramisu first. Add the sugar to the egg yolks. Beat well until the mixture is light and creamy. Add the mascarpone and half of the cognac or brandy, and beat well. Add the orange zest. With clean utensils, beat the egg whites until stiff. Fold the beaten egg whites into the mascarpone mixture. Pour espresso into a shallow dish along with the remaining cognac and 1 teaspoon of the cocoa powder. Stir well. Quickly dip each lady finger in the espresso mixture, working one at a time, and line the bottom of a glass dish, approximately 20cm round or square. Once the bottom of the dish is covered in an even layer of espresso-soaked lady fingers, top with 1/2 of the mascarpone mixture. Add the sliced banana. Dust with 1/2 of the cocoa. Repeat with another lady finger layer, then finally the remaining mascarpone and a final dusting of cocoa powder. Top with shaved chocolate. Chill in the fridge for about 4 hours, then serve! Preheat oven to around 180 C. Line three baking trays with baking parchment. Prepare a pastry bag with a plain 1.25cm piping nozzle. Separate the eggs. Whisk the egg yolks with 1/2 of the sugar and all of the vanilla. Beat until very light coloured. In a clean bowl beat the egg whites until they hold soft peaks. While beating, slowly add the salt and the remaining sugar until combined. Gently fold the beaten egg whites into the egg yolk mixture. Sieve the flour over the egg mixture and gently fold it in. Fill the pastry bag with half of the batter and pipe 9cm fingers, 4cm apart, in rows on the baking parchment. Continue with the second half of the batter in the same manner. Bake at 180 C for about 15 minutes until firm to the touch and golden. Remove the paper and fingers from the baking tray and place on racks to cool. After cooling, remove fingers from the paper and use or store between layers of greaseproof paper in a airtight container. These freeze well. How much greens should my child eat a day? 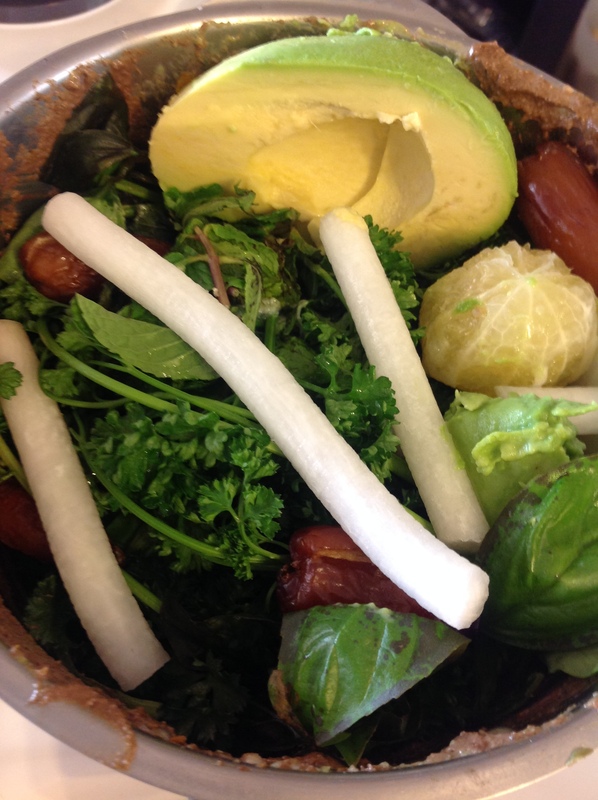 Kids (and adults too) need greens for a variety of reasons, chiefly because greens contain the nutrients essential for healing and growth. But kids are notoriously difficult to feed greens to. Parents over the generations have developed strategies and threats to get their little darlings to eat greens. And they are not wrong in that. 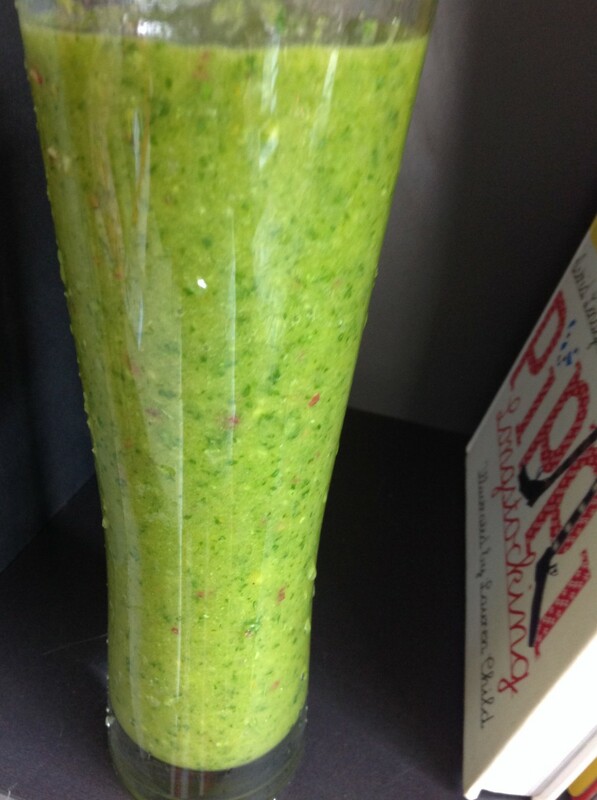 My tried and tested way has always been to get my kids to chug down green smoothies. I swear by them. Over time, they may even grow to like it. Use as many different varieties of greens as you can find. Organic, if possible. If not, wash them thoroughly. The dark, leafy ones are the best. Spinach and lettuce are tasteless, so they are good starters. Blend, and drink at room temperature, within 15 minutes. 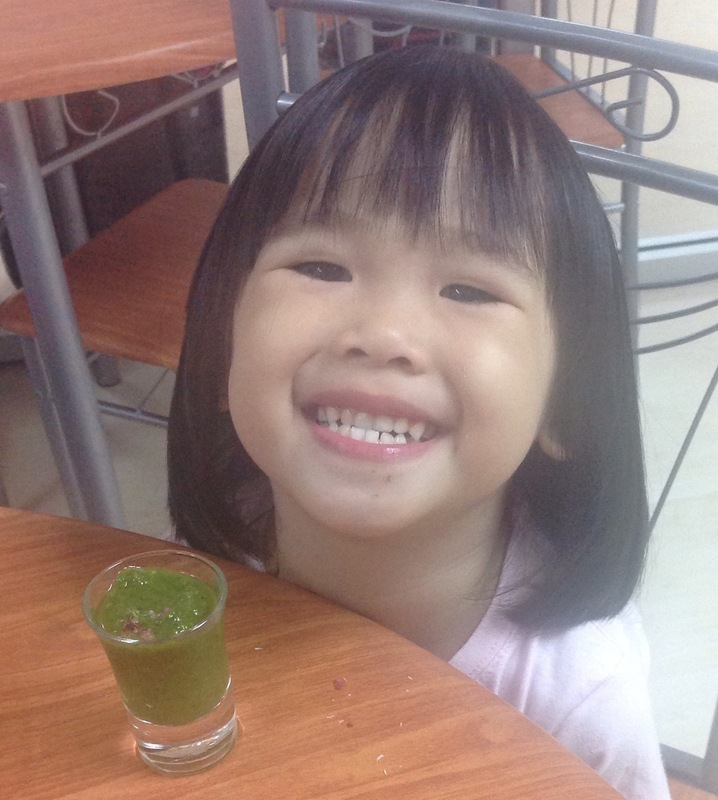 Tip: for young children and newbies, try serving the green smoothie in shot glasses, so that it looks less intimidating. This is my blend for the day: I added in dates, for the sweetness. As parents, we are obsessed with growth: our children’s academic growth. Their mental growth. Their physical growth. Their social growth. But what about our own, personal growth? When we become parents, the stimulus for the type of growth that is unrelated to children is often no longer there. Our lives become too busy, too involved, too home-centric. Emotionally, we become too preoccupied with the minutiae of daily domestic living that exclude the outside world. After all, isn’t the whole world supposed to exist within our spouse, within our children, once we attain the biological Holy Grail? One weekend, I was teaching yoga on a private island in the middle of the Javanese sea. I ended up spending the whole weekend with someone who came to my class on the beach, talking about Fate and Destiny, watching the sunset and snorkeling with my daughter. The weekend passed like an innocent, yet deeply spiritual, dream. Running for the plane that Sunday evening, I caught sight of Paul Coelho’s book, By The River Piedra I Sat Down And Wept. I stopped dead in my tracks. I was compelled by something deep in me to walk into the bookshop and buy the book. I have read this book years ago. It is the story of a man who passed through his hometown on his way to becoming a priest, and his childhood friend Pilar. I had loved this book when I first read it. Impulsively, I bought it for the man who asked me about Fate and Destiny. I did not have a full address for him: I knew where he worked but not the building that his office was located in. Nevertheless, I bought the book and dropped it in the mailbox in an envelope simply labeled, Antonio Castellano, McKinsey & Company, Jakarta. I hoped that this book would give him better answers than I did. I did not hear from him for weeks. Not that I expected to. Indonesian post is notoriously unreliable. Small parcels with incomplete addresses have even less of a chance of reaching their destinations. But torn and tatty, that Coelho’s book did reach him. He took it travelling with him. Coincidentally, he was travelling in Spain, where the story was based, for an INSEAD reunion followed by soul-searching time. He read the book and wrote me a long, beautiful email that changed my life. I quoted an excerpt on the last page of the book that I dedicated to him, about strength, pain, learning, joy, growing. Only this weekend, Friday 15th of August 2014, when the core of my being was engulfed with momentary darkness, I read Antonio’s first email to me, about the pain of growing mentally, emotionally and spiritually. We need to grow, to move towards self-realisation. After all, is that not the purpose of our life, rather than merely fulfilling aspects of biology? I don’t want to emerge from the shell of my safe, comfortable existence. I haven’t wanted to, for a very long time. In my family, the whole world exists. There is nothing else to risk for, to move towards, to grow for. But Antonio Castellano, the boy from Sicily, is the teacher that the Universe sent to me when I thought I had nothing else to learn. I was happy being a part-time doctor. I didn’t have to think too hard, I enjoyed my work and I adored my boss, my boss’s family and my colleagues. I existed in a safe, comfortable world, where I could still justify my existence by telling myself that I save lives whilst bringing up children. But soft, brutal, gentle, he led me to the deeper recesses of my mind, to the deep lagoon where unanswered questions and unborn dreams stagnate. I could not pass through this life without liberating them first. So I dived in, via the safe seas of his blue Sicilian eyes. It culminated in my 10,000+ word long essay, Ten Most Beautiful Equations in the World. The equations liberated and exhilarated me, gave me the answers that three years in Oxford could not. He led me, oh so gently. We talked about Theoretical Physics and God, after his long day at work doing deals. We talked about scientists in Einstein’s time, men who lived in the small attics of Zurich, fuelled by a passion that made the hunger, frustration and sacrifice worthwhile, driven only by the belief that within the grasp of Man’s limited potential is the unbounded potential to understand the mind of God. I wrote down Heisenberg’s Principle of Uncertainty. He did not know what those symbols meant. And so he wrote for me, deep insights from his soul. And so he read to me, the words that matter. He is one man who could go from English to French to Italian and back to English seamlessly, poetically. I grew, mentally, emotionally and spiritually with him. “Why did it take you so long to contact me after you have received my book?” I asked curiously. It took him a long time to answer that question. Just as I had taken a long time to answer the first ever question he asked me, on that magical weekend on that magical island several years ago, the question about Fate and Destiny. Dear Antonio, here is one half of the answer to your question (on Fate); I will answer the second half (on Destiny) at the end of my life, if I have the strength to grow more. I pray that I do. Message of the day: Dear readers, take the risk. Send someone a book that echoes the words in your soul. If the stars are aligned, it will be a growing opportunity for you. Embrace it. On of the most disquieting things I heard in recent months is a 9 year old girl developing breast cancer. Of course, the causes of cancer are multifactorial, namely genetic, environmental, lifestyle and nutritional, to name a few. There is no one culprit that we can definitively lay the blame squarely on for making the C-word mainstream. But there is no doubt about it: more and more pharmaceutical by-products are seeping into our food chain, chemicals that are not meant for human consumption. In eggs that you buy in supermarkets, for example. Eggs are good sources of nutrition. They are versatile, delicious, and an affordable source of protein. 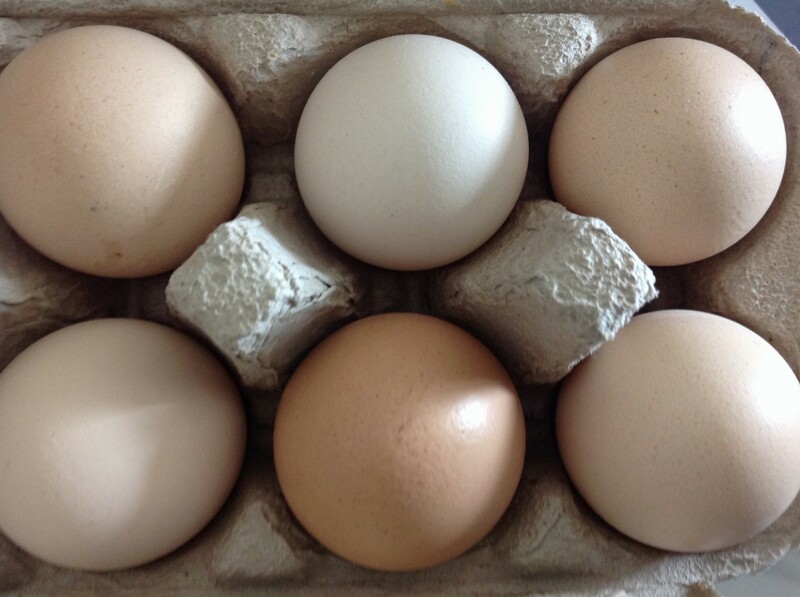 But it is so difficult to find organic eggs that are free from growth hormones and antibiotics. These are more expensive that the normal ones, sure, but are still reasonable cost-wise compared to other sources of proteins. I bought eggs with a particular strong branding implying that the products are healthy and green, but a perusal into the company website showed that the eggs are not free from stuff that I do not want in my body (especially my growing child’s). In the tropical paradise of Phuket, ‘clean’ eggs are not easy to find. What are clean eggs by my definition? I want eggs that are cage-free (I don’t want them laid by hens in battery-cages), antibiotics-free and hormones-free. If possible, I want eggs that are organic as well, namely the laying hens are not fed with animal byproducts or genetically modified (“GMO”) crops but are fed with feeds that have been produced on land that has been free from the use of toxic and persistent chemical pesticides and fertilizers for a minimum of three years. Apparently, the supermarket in Central is one of the few places (other than specialised organic shops) that one can find these pure eggs, though I am not sure how rigorous the organic certification in Thailand is. But I was very happy when my neighbour Richard Boyle presented me with a dozen. Now that I know where I can lay my hands on them, I will be cooking up a storm with these babies. Stay posted for yummy recipes! 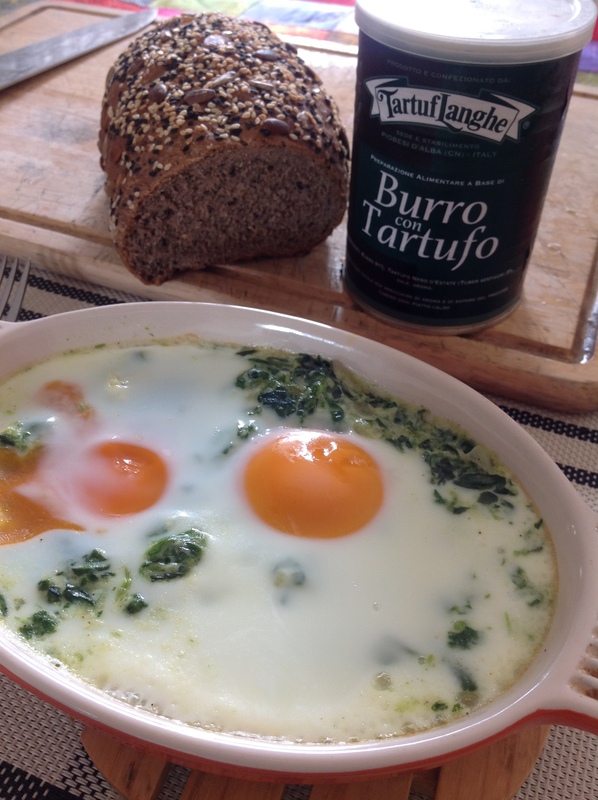 The eggy treat shown below is from a previous post: Spinach and eggs, German-style. 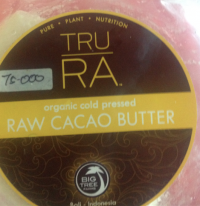 Served with truffle butter on warmed toast, it is sheer decadence. 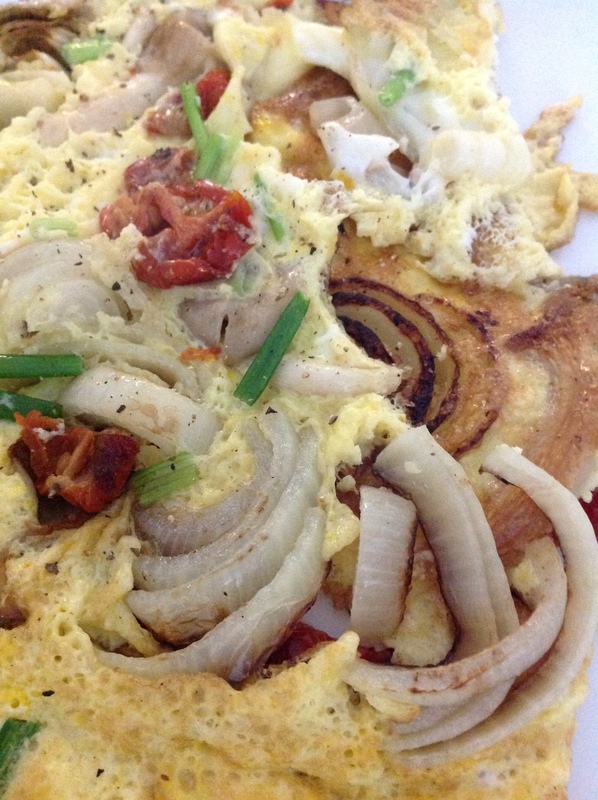 And finally, don’t forget the simple omelette. Load it with sweet Spanish onions, mushrooms and sun-dried tomatoes for a wonderful, protein-filled treat (gluten-free too). Scrambled eggs: Cook until firm, not runny. Fried, poached, boiled, or baked: Cook until both the white and the yolk are firm. Egg mixtures, such as casseroles: Cook until the center of the mixture reaches 160 °F when measured with a food thermometer. 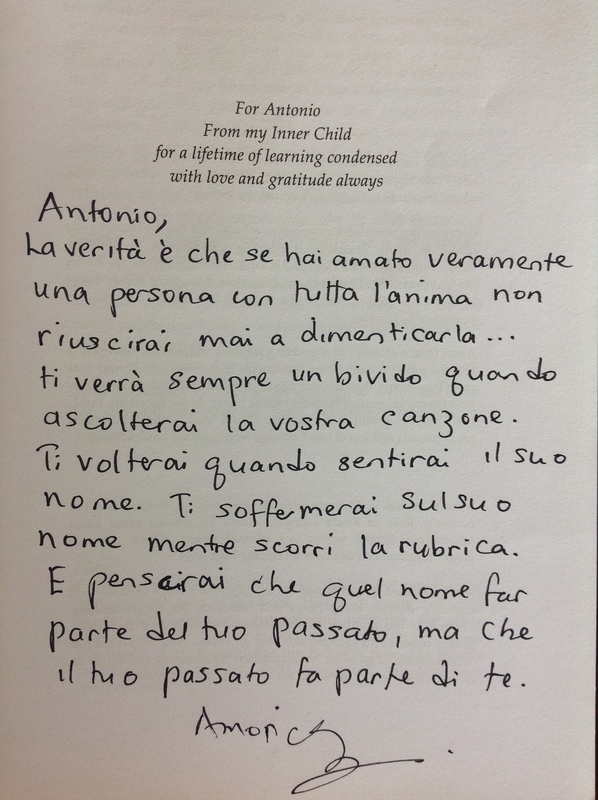 Two years ago, I wrote a parenting book, Barefoot in the City, and I dedicated the book to Antonio Castellano. Antonio works for McKinsey & Company. He worked crazy hours in Jakarta. But in the fast-paced world of international business, Antonio never stopped being the boy from Sicily who loves football and who stays close to his boyhood friends. He holds on to the values of the old world and his connection to what that is real and meaningful. This I admire and love deeply, because it is so easy to lose our way when a fast and glamorous existence beckons. Lost, we develop a new set of values, a new reality, to justify our less-than-honourable actions and selfish choices in pursuit of temporary highs and fools’ gold. My eldest son Nicolas is 29, and plays in the same fast and glamorous world as Antonio. I have told Nicolas several times in the past, get close to Antonio, talk to him, learn from him. Never forget where you come from and the values that your parents brought you up with. Be like Antonio. After all, both men are not that dissimilar: both are the eldest of five children, both are sons of mothers who are religious and who are doctors, both have fathers who are ten years older than their mothers, who are wonderful, strong fathers. Both are successful, despite their idyllic childhoods. Antonio endeavours to spend several weeks a year in Sicily at Christmastime with his family, despite his hectic work schedule and ample opportunities to be somewhere else glamorous. But for Antonio, it has always family and home. He doesn’t forget. His bag spills with goodies for me, even though he travels with carry-on luggage only. I dive on the goodies, cooing gleefully like a little girl, completely ignoring the little Hermes box. Ambrogio, his boyhood friend, who wrote the beautiful story about wartime love in Monte Rosa. Antonio remains in close contact with his boyhood friends. Four hours after arriving in Milan, I faced six of those guys, and he was sitting there, happiest as I have ever seen him, as they teased him mercilessly about his (lack of) footballing skills. This is his world, this is the real world. This is what that really matters. That deep connection and transmission of old values are maintained throughout the year whilst he was in Jakarta by the effort of his Uncle Sal. Uncle Sal is a schoolteacher back in Sicily. He would send recipes, along with his teachings. As we ate the food, so too we imbibed the good values from home. Through Antonio, I started to feel proud to be quarter Italian. So my question is, do we invest enough in teaching our children core good values? And do we do enough to keep the education going for our older children? Do we hold them close enough in adulthood so that they don’t lose their way? Have we ourselves lost our way? And it was precisely for this reason that I wrote my parenting book, a book about raising kids to be happy, strong AND decent human beings. Someone that his parents can be proud of, someone who leaves a legacy of light in a darkening world. As with the book, I dedicate this blog to another woman’s son, the boy from Sicily who grew up to be the man who read to me, cooked for me, and sat with me in the Catholic church in Jakarta, the sweetest moments ever. Lei, Castellano. My message for the day: hold your children close, hold each other close. Spend more time in your hometown, connect those old values once more. And if you have time, read the fable of Icarus. I don’t think men are ever ready to have kids. When I told the father of my children I was pregnant, he went off sailing for a week with zero contact (whilst my mother fretted and my father went ballistic). In that time, I thought seriously about having an abortion because I had already been accepted for medical school. He, in the meantime, contemplated running off to Paris to start a new life. Looking back, I don’t blame him. He was in his twenties, enjoying an exciting, selfish life to the maximum. He worked enough (rather than climb the career ladder) to feed his hobbies. Feeding kids certainly wasn’t on his agenda. He lived out of a suitcase in his friend’s back room, spending all his money on his three boats and alcohol. I told him the news at Langstone Harbour, England. I had walked there, to make it more dramatic. He was about to set off for the Olympics Trial. He was ranked 21st in the country for the Finn class sailing, and was filled with optimism and excitement for a bright future ahead. Getting the one-night stand pregnant certainly wasn’t on his agenda. But he came back, and came through strong for his child and I. Beneath the hellraiser was a decent, honourable Catholic boy. He came back after a week at sea. Though I freed him of all obligations, he wasn’t going to let me bring up his child on my own. He wasn’t going to allow me to have an abortion. He believed in the sanctity of life, that life is a gift whatever the circumstances. Of course he wasn’t the perfect partner. To start off with, we are so different from each other, with nothing in common except animal passion. He wasn’t excited the way first time dads are supposed to be. He didn’t want to attend parenting classes or go shopping for baby things. He couldn’t understand how I changed from a fit, sporty person to this hormonal, weak woman. He just didn’t want to know. But when his first son arrived, there was just the biggest smile on his face. Those startling blue eyes softened the way I have never seen them soften. His big hands cradled the new life we had unwittingly, accidentally, made. He came to his firstborn with such reverence. My mother said she will never forget the smile on his face as he walked down the path to my house at 8am on the unforgettable April morning to tell my parents the news in person. He walked, with pride and happiness radiating from him, my blood and amniotic fluid still on his jeans. My mother said she often sees that young man walking down the path, almost three decades later. He was the perfect father the moment he held his firstborn, and he continues to be the perfect father for all his children. He is the one who read to them every night and kissed them with gratitude every night, more so than me. And that summer, standing on Langstone Harbour, we saw his beloved Fireball sailing out in the Solent with her new owners. The sail was billowing, and someone was on the trapeze on the boat, skimming the waves, cruising at speed. “There she goes,” he said with emotion, blue eyes crinkling as he stared at his beloved Fireball setting off. We were leaving our much-loved Portsmouth, where I come from, to go to Manchester, where I will be starting university, to an uncertain future, far from the life that we had originally intended. It’s August 2014. In 18 months’ time when we return to England, I will buy him a Fireball so that he may sail in these waters once more. Though the years have aged him, the blue in his eyes never changed. He will always be the man I love, the father of my children. Looking at our big brood of beautiful children, I know I couldn’t have asked for more, because what is life, if not family? And so, with learned wisdom and experience, here’s what I think: men are never voluntarily ready to trade in their carefree life for fatherhood. It’s just too scary, and if you read Richard Dawkins’ book, The Selfish Gene, it is counter-intuitive biologically. You just have to pick a decent one to give your womb space to, that’s all. Tip: Spanish genes and Catholic upbringing are strong bets. G dislikes cooking. She thinks it is ‘boring’ and a waste of time, and tries to get out of kitchen duties at home all the time. But preparing good healthy food is one of the life-skills that I absolutely insist my children learn from a young age. No excuse. Even if you are destined to be a star, you need to be self-sufficient. You need to learn how to take care of yourself. 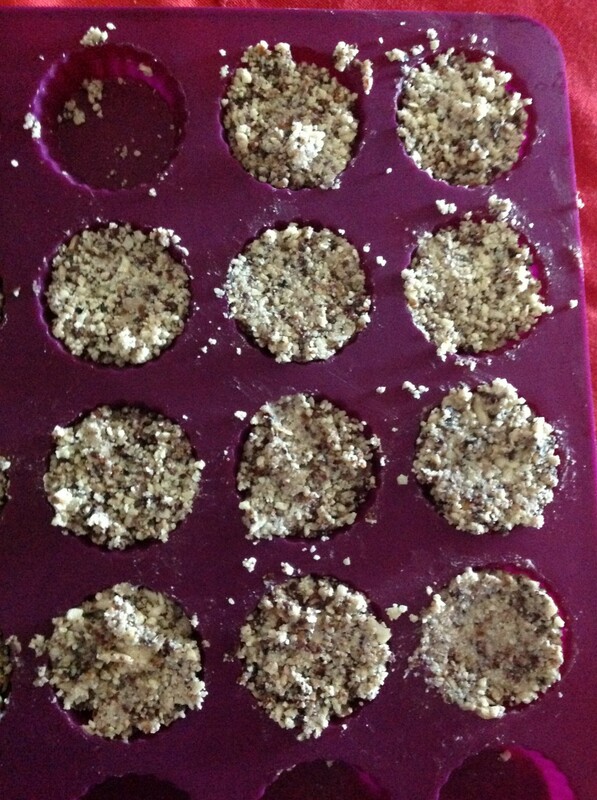 Here are some cacao bites that G made. 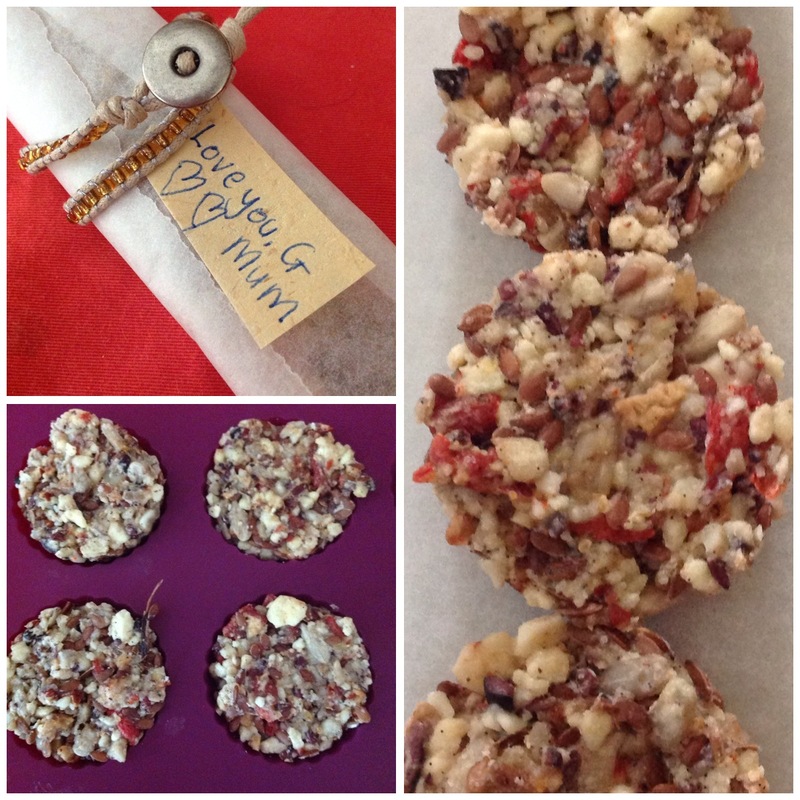 They were inspired by the almond bars I had at Alchemy, the lovely raw food café in Ubud, Bali. It can’t get any simpler, or healthier. They are pure energy food, far better than any of the energy bars that you pay exorbitant prices for. Those shop-bought energy bars are full of sugars. These homemade ones are not. Make them the G way, and you won’t regret it. Combine all ingredients in a powerful blender. Adjust the coconut oil to a binding consistency. Press dough into silicon moulds and chill until firm. They are then ready to be popped out and enjoyed. We are not run-of-the-mill parents. We had tried – unsuccessfully – to persuade our older children to be beach bums like us. Didn’t work. They all went to universities and gotten respectable jobs as soon as they could. Hmm, it must be backlash against having hippie parents. We raised our kids differently. We did not fret when they couldn’t read at 6. We didn’t bat an eyelid when they did not come top of the class (or anywhere near the middle). Why fret? Life is not a race where there is a prize to be won for being the youngest to achieve something. Indeed, G never really read until she was 9 or 10 – right till then, her father read to her every night. But she is in the top set of an academic school for every subject. It goes to show, a bright kid can always get to the top at the appropriate time. In the meantime, he or she has more important things to learn first, that will provide a foundation for all future learnings, that become their character. Childhood is for learning other more important things than doing worksheets or memorising facts. Children have to be out there, living life in 3D and getting to know their world firsthand. It instils confidence in them and also a sense of being comfortable in their environment. It is from this base that they climb higher to achieve bigger things in the bigger world. 6. Have friends of other generations, nationalities, and social strata. I swear G’s success stems from her physical confidence. Feeling bored hanging around the lagoon, she swam out into the open sea, out to the yacht 300 metres away, to join the boys without a second thought. Priceless! Food, food, food! We sat on the beach in Phuket, eating Pad Thai. Sorry to say, I did not like it (must be my delicate tastebuds, since both Thais and foreigners alike rave over street Pad Thai at 80baht a plate). I did not like eating rice sticks with lots of flavourings and crushed peanuts. Nutritionally, it is bankrupt. We moved on to fried pancakes and bananas with nutella and honey. 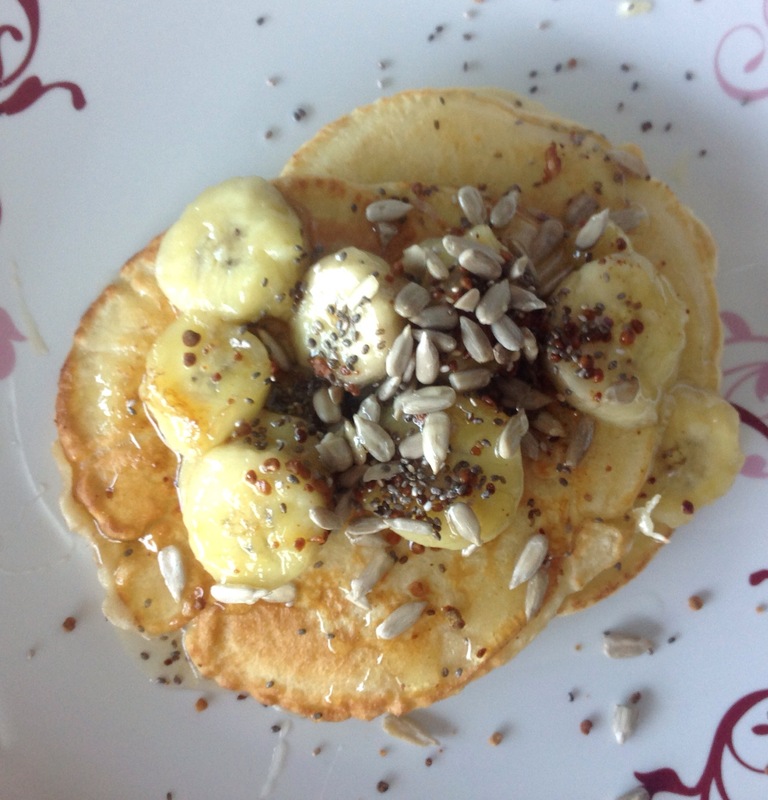 They tasted a whole lot better, but the pancakes were nutritionally bankrupt, too. These types of food fill you up, might taste delicious even, but there is not much nutrients in them, just carbs. And help, my 14 year old is growing at a phenomenal rate, she needs good proteins! And so this amazing dish that I recently learned from my German-Indonesian friend, Inge, who lives in Jakarta. I will be eternally grateful to her. It is so simple to make, and is full of goodness. And what I love about it is, it is a storecupboard dish. I always have frozen spinach in the freezer and UHT cream in the larder, so no hassle whatsoever to rustle up this goodness. Saute the chopped onion in butter until translucent. Roughly chop the spinach, add to the pan. Add the flour and grated nutmeg. Add seasoning, and then add the cream and milk. Adjust for a thick, slurry-like consistency. Spoon into oven-proof dishes. Crack an egg or two on top of each. Bake until the egg whites are cooked and the yolks slightly runny.